The Geffen gets a new Billie Joe Armstrong Shakespeare Musical! Geffen Playhouse opens its 20th anniversary season with the west coast premiere of These Paper Bullets! A Modish Ripoff of William Shakespeare’s Much Ado About Nothing, September 8 – October 18. 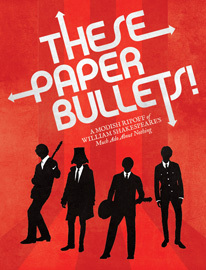 Written by Pulitzer Prize finalist and Emmy Award nominated writer Rolin Jones (Friday Night Lights, Boardwalk Empire) with songs by Green Day’s Billie Joe Armstrong and staged by Jackson Gay, These Paper Bullets! was commissioned by Yale Repertory Theatre where it premiered in 2014. Meet the Quartos. Ben, Claude, Balth, and Pedro. Their fans worship them. Scotland Yard fears them. And their former drummer will stop at nothing to destroy them. Can these fab four from Liverpool find true love in London and cut an album in seven nights? The cast features James Barry (Pedro), Kate Blumberg (Paulina, Frida), Damon Daunno (Claude), Chris Geary (Anton), Mr. Crumpet, Queen & Others), Brad Heberlee (Mr. Urges), Justin Kirk (Ben), Tony Manna (Mr. Cake), Rod McLachlan (Boris), Kiera Naughton (Ulcie), Adam O’Byrne (Don Best), Lucas Papaelias (Balth), Nicole Parker (Beatrice), Greg Stuhr (Mr. Berry), Ariana Venturi (Higgy), Nick Ullett as (Leo). These Paper Bullets! is a co-production with Atlantic Theater Company in New York and will be performed there following the Geffen Playhouse engagement. The two theatre companies last teamed-up in 2009 for the Atlantic Theater Company production of Farragut North starring Dan Bittner, Mia Barron, Justin Huen, Chris Noth, Chris Pine, Olivia Thirlby and Isiah Whitlock, Jr. The Geffen will also host over a dozen pre-show and post-show Signature Series events during the show’s run. These include TGIF at the Geffen, Talk Back Tuesdays (Audience Q+A with artists), Lounge Fridays, Girls Night Out, and Wine Down Sundays. Many of them include refreshments, music and other festive elements. These events are complimentary as part of your ticket price, thanks to the support of Geffen Playhouse partners and sponsors. Click Here for Signature Series dates and more information.